Poe Dameron #27 is an interesting issue as they continue to give some post-The Last Jedi glimpses while Poe tells some tales from The Force Awakens. We get to see another look at Poe’s flyby on Takodana, the secret recon mission the Resistance did to scout out Starkiller base, and an awesome little moment between Chewbacca and Nien Nunb. This one isn’t so much an overarching story as it is a bunch of cool moments. But it works. The issue opens with Leia remember Han, which is a touching moment. It’s followed by Nien Nunb joining Chewbacca in the Millennium Falcon’s cockpit and doing a fist bump, which is pretty awesome. We definitely need a Chewie and Nunb story now. Anyways, there’s a two page spread afterwards showing Poe’s attack run on Maz Kanata’s castle and showcasing his nine kills against the First Order. They flash back to the present and clearly state that Poe doesn’t have the Force. They also mention that Force tree he grew up with, and make good use of Finn as comedic relief as he struggle to understand how the Force works. A porg butts in, and Poe doesn’t an awful job of bonding with Rey, going so far as to bring up torture buddies. Afterwards, the story focuses on Snap, Kare and Jess as they prepare to scout out Starkiller base. There’s a cool glider pod that Jess made, and Snap winds up flying it with Kare delivering onsite. There’s some nice tension for the mission, and it’s a good little story. The artwork throughout the issue is just gorgeous. Angel and colorists out did themselves here. It’s that good. The lighting, the depictions of the characters, the layouts and panels, all top notch. 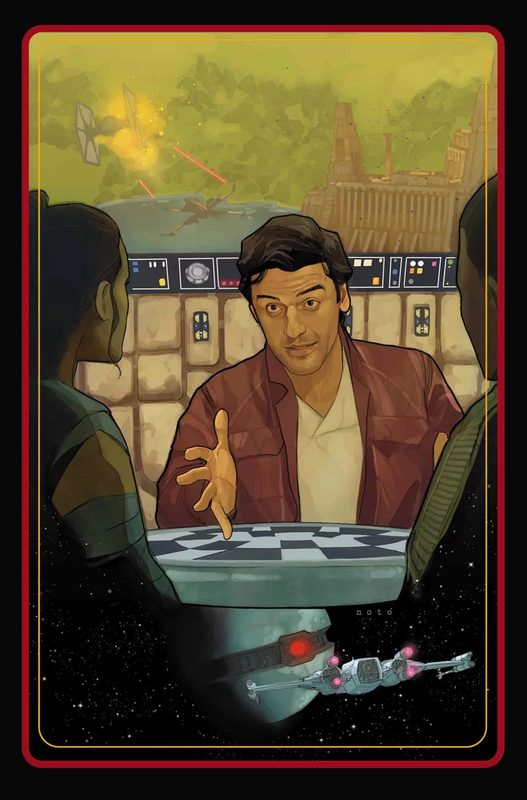 With great artwork and fun little stories, Poe Dameron #27 hits all the right marks. I give it a five out of five metal bikinis.